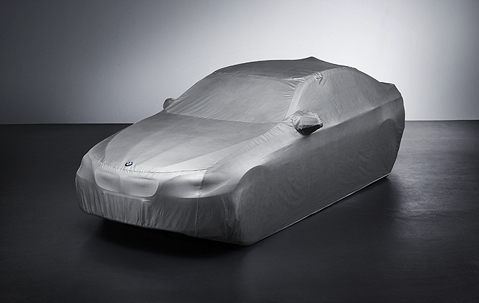 Washable and precisely fitted to the BMW 5 Series. Easy to put on and take off. Silver in colour, with a surface that is heatproof and dirt/water-repellent. With ventilation openings and BMW logo. 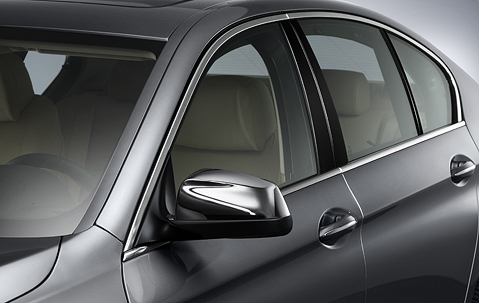 Perfectly complement the unique styling of the BMW 5 Series. Not for M5. Dirt-repellent and water-resistant. 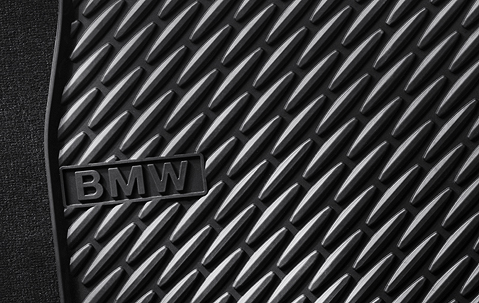 The all-weather floor mats from BMW are 100 per cent recyclable. Available in black or Veneto Beige. Quick and easy to attach to the rear windscreen and rear side windows. When not in use, it can be stored in the bag supplied. 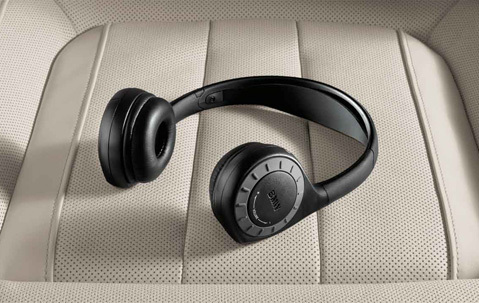 With an exclusive BMW design and specially adapted to the optional Rear Entertainment system.Featuring digital, interference-free transmission, volume control, high-quality sound imaging and excellent comfort. For vehicles from 07/12 with Rear Entertainment (option 6FH/6FR). Secures objects of varying sizes quickly and safely. Attaches to the eyelets that are fitted as standard to the floor of the luggage compartment. 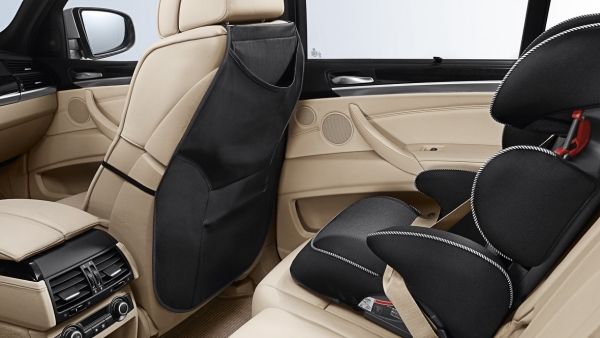 The backrest protector, which keeps the backs of the driver and front passenger seats free from dirt and damage, is particularly suitable for trips with children. It can be fitted and removed in just a few simple steps and is machine-washable. A surprisingly handy companion. 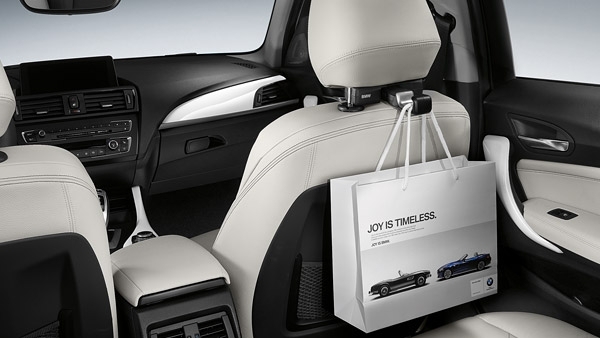 The backrest bag can be filled with small objects before the journey commences and quickly attached to the backrest of the driver or front passenger seat. Can be folded up and easily carried. Durable and easy-to-clean material in black/red..
With “BMW” lettering. 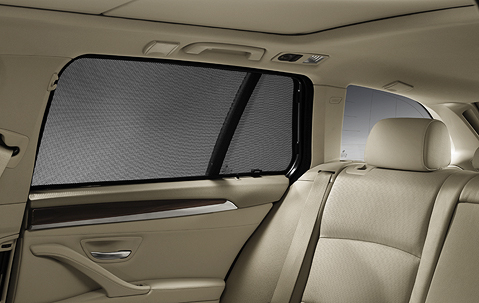 Can be easily attached to the sun visor or handles, for example. Can be operated with a single hand. A soft inner material prevents glasses from getting scratched. 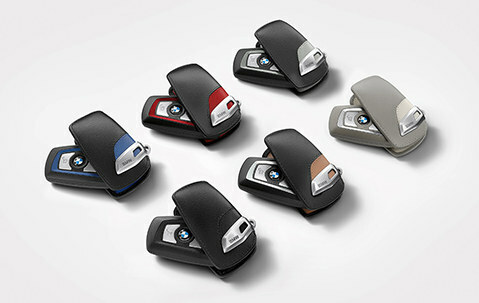 Attractive fine-leather case for your vehicle key. Also available in the Sport, Urban and M Sport package variations to match your respective vehicle line. 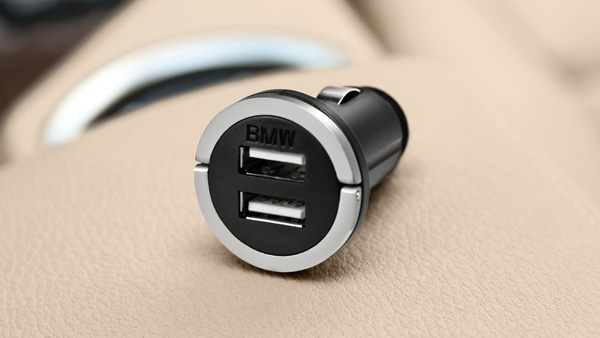 The original BMW USB charging adapter is simply inserted into the cigarette lighter. This allows various external devices to be quickly and conveniently charged, such as a smartphone or MP3 player. 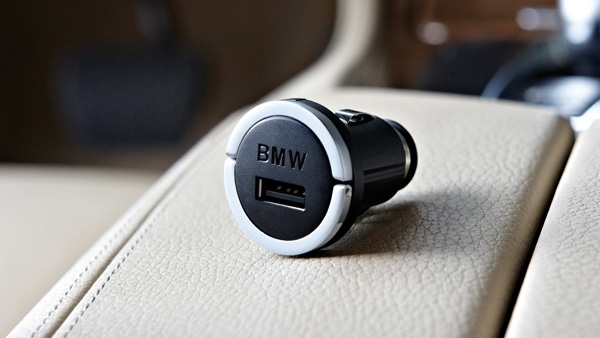 Conveniently charge mobile devices in the vehicle via the cigarette lighter. 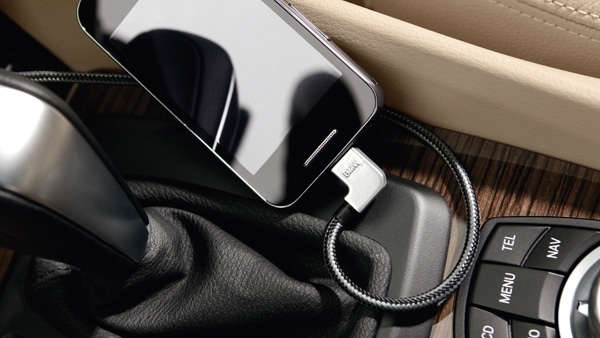 Charge up to two mobile devices at the same time. Higher charging current enables fast charging (Quick Charging). Suitable for the iPhone, iPod, iPad and many other mobile USB devices. Easy handling, compact, ideal for on the road. Perfectly suits the interior design of the car. For individualized music enjoyment, various audio sources can be integrated into the vehicle and charged using the micro USB adapter. An MP3 player or smartphone can then be directly operated via the car’s own built-in system. 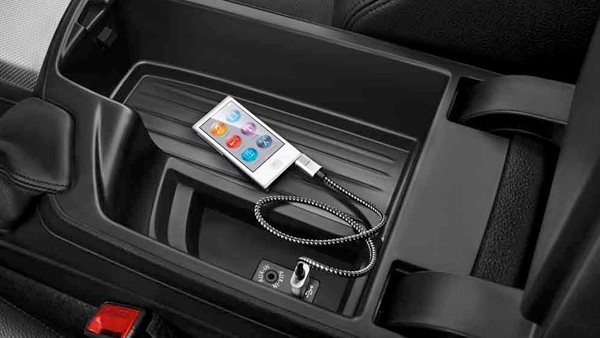 An Apple iPod or iPhone can be integrated in the vehicle and charged using the USB adapter. Music collections stored on the device can then be played via the car’s loudspeaker system. 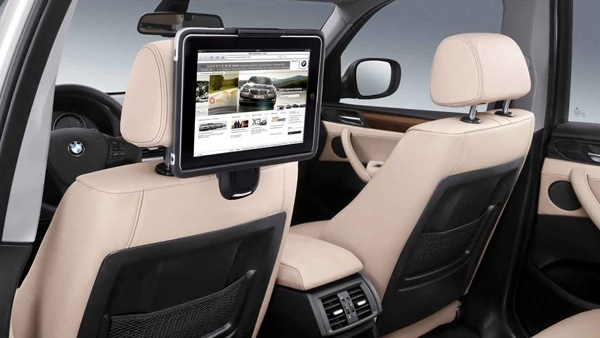 The system can be operated either via the iDrive Controller, multifunction buttons on the steering wheel or the radio. Slightly smaller than the Roof Box 460, but equally convenient and sturdy. Features anti-theft triple central locking. 320 ltr. (11 cu.ft). Dimensions: 75″L x 24″W x 15″H. Silver or black top casing with black bottom casing. 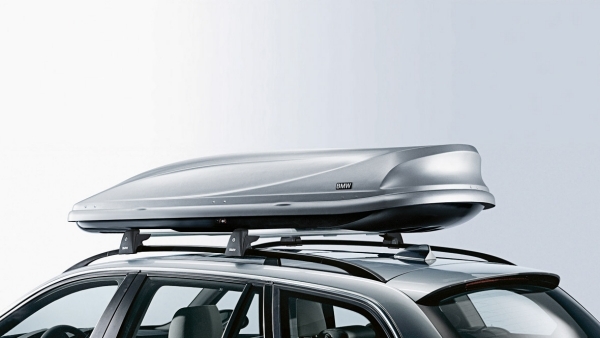 The Roof Box 460 is easy to load, thanks to an innovative system that opens from both sides. Features anti-theft triple central locking. 460 ltr. (16.2 cu.ft). Dimensions: 91″L x 32″W x 15″H. Silver or black top casing with black bottom casing.BMW Base Support System required. Dimensions (LxWxH): 91″ x 32″ x 15″. Unladen weight approximately 57 lbs. Capacity approximately 16.2 cu.ft.. This sturdy attachment transports touring cycles, mountain bikes or racing bicycles with 1” – 2.1” frame diameters and tires 1” – 2.2” wide. Lockable. 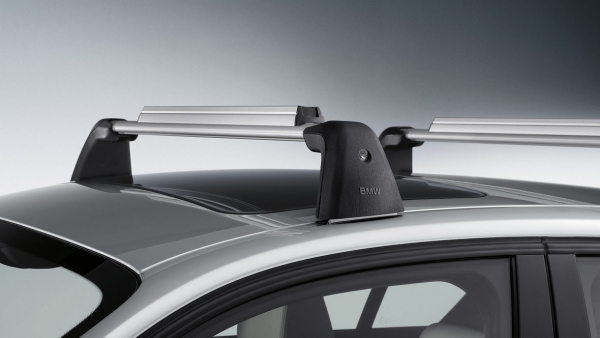 (Requires base support, as shown)BMW Base Support System required. Vehicle must be equipped with roof rails.. 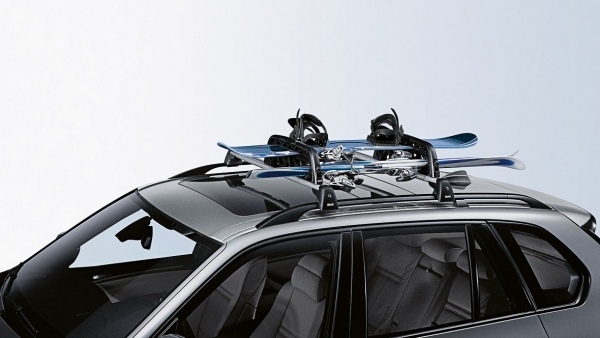 This dual purpose transporter offers two Ski and Snowboard configurations and can accommodate either 2 pairs of skis, 2 pairs of sticks and 2 snowboards or 4 pairs of skis and 4 pairs of ski sticks.BMW Base Support System required. Please note that clamping width at the ski holder is 3.0 inches. 89.8″ x 32″ x 12.2″ ( L x W x H) Unladen Weight: 60 lbs. (approximately) Capacity: 15.9 cu.ft. (approximately). 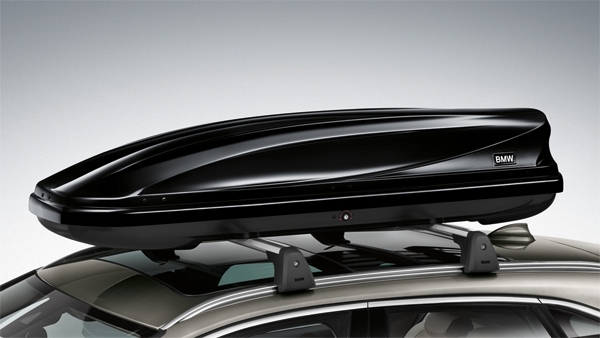 Vehicle must be equipped with roof rails, contact your center for more information. The coat hanger allows clothes to be transported without creasing. 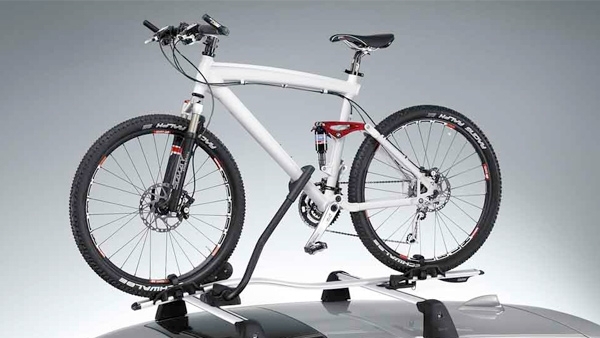 It can also be detached from the mounting and used to carry clothes outside the vehicle. 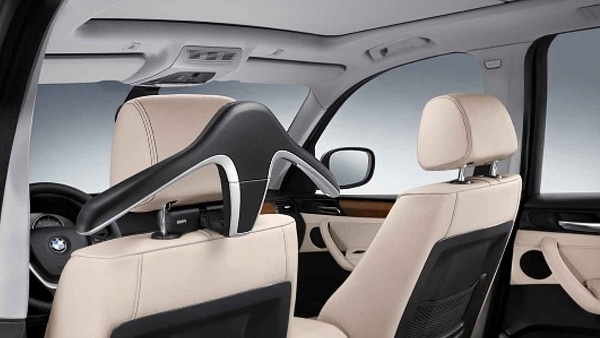 The modular Travel & Comfort system is designed around a separately available base support that can be easily fixed between the headrest bars. A coat-hanger, folding table, universal hook or an Apple iPad holder can then be fitted. Only in conjunction with base attachment. 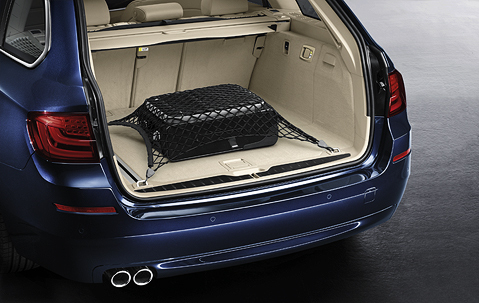 The modular Travel & Comfort System utilities a basic carrier that can be easily mounted between the headrest pillars. This can then be used with a clothes hanger, a folding table, a universal hook or a holder for the Apple iPad. 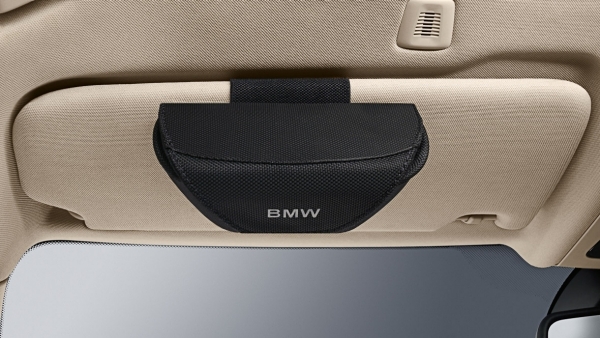 The high-quality design of the Travel & Comfort System is available in matt Black with silver accents and is a perfect addition to interior of a BMW. Base attachment for Travel & Comfort system. The universal hook can be used to hang items such as light bags or a garment bag. The folding table provides practical desk space for rear passengers. Both the height and the angle are adjustable. It also features a fold-out cup holder with a sophisticated chrome edge. Quick-release fastening on the front wheel fork and a belt fastener on the rear wheel keep your bike or cycle in place. 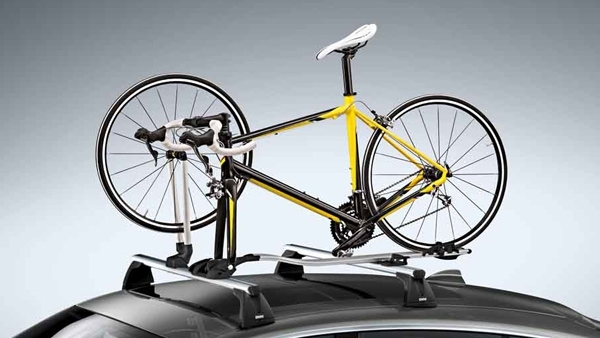 A holder that secures the front wheel of the bicycle to the roof rack base is also available. Requires BMW Base Support System-as shown. Travel & Comfort system, Holder for Apple iPad. 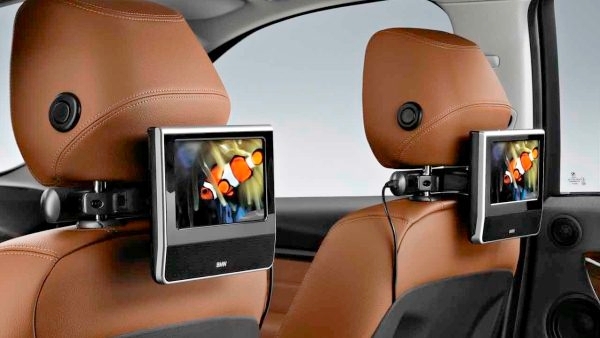 Infrared stereo headphonesSpecially designed for use with BMW DVD systems. 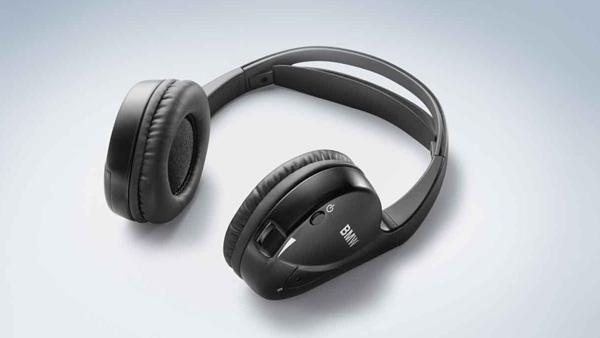 With individual volume control, outstanding sound quality and excellent comfort. For vehicles with DVD system in the rear. Capture the finest moments of your drive with ease. 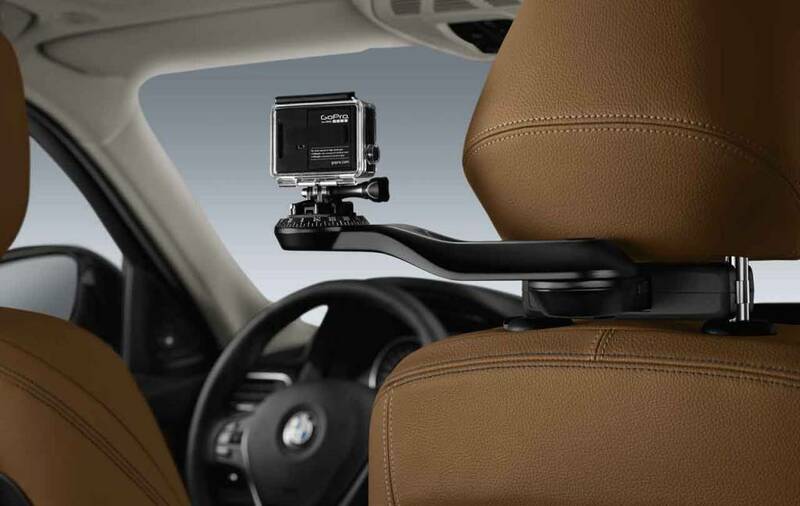 These BMW GoPro mounts eliminate camera shake, making for razor-sharp images. The interior BMW GoPro mount, in high quality plastic and with a BMW design, installs easily, connecting to your BMW’s head restraint. With its flexible 360-degree rotation, your GoPro will not miss a single picture. For vehicles with ConnectedDrive, the GoPro camera can even be operated using the Controller and the display. Alternatively, the camera can be operated exclusively through the GoPro smartphone app.